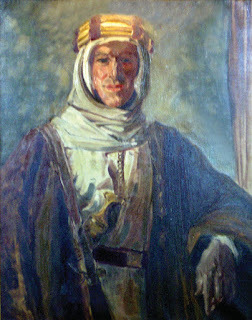 Colonel T. E. Lawrence by Augustus John 1919. Hanging in Jesus College Oxford. Photo by D. Graves. Who were the famous people he excavate with? Lawrence and Sir. Leonard Woolley (right) at Carchemish, spring 1913. Lawrence, T. E. The Letters of T. E. Lawrence. ed. David Garnett. London: Cape, 1938. Meyers, Jeffrey. The Wounded Spirit: A Study of “Seven Pillars of Wisdom. London: Martin Brian & O’Keeffe, 1973. Meyers, Jeffrey. “T. E. Lawrence and the Character of the Arabs,” Virginia Quarterly Review 80, no. 4 (2004): 135-152. Moorey, Peter. R. S. “Cemeteries of the First Millennium B.C. at Deve Hüyük, near Carchemish, Salvaged by T. E. Lawrence and C. L. Woolley in 1913,” British Archaeological Reports International series 87 (1980), 3–4. Pringle, Denys. Introduction to Lawrence, Crusader Castles. Oxford: Clarendon, 1988. Stewart , Desmond. T. E. Lawrence: A New Biography. New York : Harper and Row Publishers Inc., 1977. Tabachnick, Stephen Ely. and Christopher Matheson, Images of Lawrence. London: Cape, 1988. Tabachnick, Stephen Ely. Lawrence of Arabia: An Encyclopedia. Westport, CT: Greenwood, 2004. Wilson, Jeremy. Lawrence of Arabia: The Authorized Biography of T.E. Lawrence. New York: Atheneum, 1990. Woolley, C. Leonard and T. E. Lawrence. The Wilderness of Zin. London: Palestine Exploration Fund, 1915. Woolley, C. Leonard, Lawrence and P. L. O. Guy. Carchemish: Report on the Excavations at Djerabis on Behalf of the British Museum, 3 vols. London: British Museum, 1914, 1921, 1952.